The long-awaited teaser trailer of Rusty Lake Paradise! We have been working day and night to get this game done for you and we can finally see the pieces falling into place. Unfortunately the whole process is taking a bit longer than expected. We still cannot disclose a release date with you, all we can say we are getting closer and closer. The game features a very big achievement system, Victor made an incredible soundtrack and Johans background is fitting perfectly again. Currently we are working together with a sound designer and we hope to add some voices for the Family next week with the help of Bob Rafferty, who also made this awesome teaser! Thanks for the support, Paradise is coming! Oh my god so amazing I can’t stop waiting!!!!!!!! Hard to wait.. But, I will wait!!! They are gonna have real voices? That’s awesome! I just can’t wait!!!! So excited!!! Thanks for Rusty lake team,I love the games. Looks like we have familiar guests there. 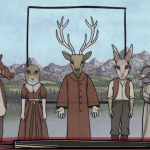 This is gonna be interesting plot twist into the Rusty Lake history. soooooooo exciting!i love.rustylake games and i am looking for the new game!!! très impatiente de pouvoir jouer!!!!! Yes, I’m so excited waiting for this new release. Yeah! I can’t wait to play it! im waiting this for 3 months and finally comes out! still left but i can wait so if you completed game please notice me to send email! of course you are anyway i love your games and thank you for making these games! I’m SO ready for this game! I cant wait!!!! Yasss another game coming! 😀 Sooo excited! OMG I Cant wait !!!! I love Rysty Lake Games !!! Its the best !! Come on!I’m looking forward to it. Checking the website and Apple store every day, can’t wait, it’s gonna be before Xmas right? Pls~~ Regards from HK and thx for the team! It’s fantastic that there’s another ‘Paradise’ which is one of the themes of a real world roombreak in our city and it’s also quite popular! So I’m looking forward to both Paradise! I hope I can play it with my roommate before the winter holiday. The game would make such a perfect Xmas gift to my adult siblings!! it’s really a long journey from ground to paradise haha, just looking forward to the update! Probably my favorite game series! Please comtinue for many many more years and games!!! Really want to play this game..